LocBoard heavy duty black epoxy coated steel pegboards with square holes offer the ultimate holding capacity for the most demanding tool and storage needs. The epoxy coating makes them scratch resistant. 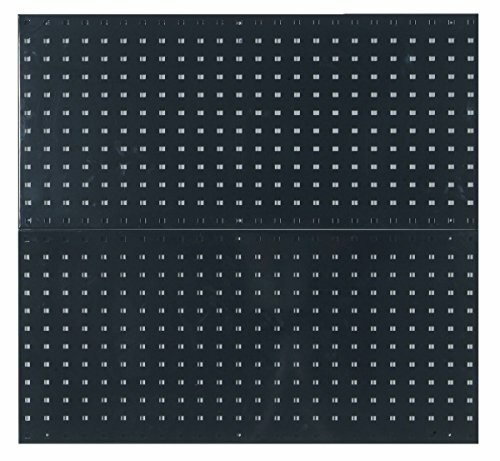 LocBoard heavy duty steel pegboard is ideal for use in a clean room, factory floor production area, maintenance, repair areas, home and garage. Use only lochook 50000 series industrial strength hooks and steel shelf with patented 2 and 4-point contact locking mechanisms to create the most secure and reliable pegboard system for commercial and home tool storage and other work items. The most demanding tool storage requirements for power tools, large and odd shaped tools are easily met using the LocBoard steel pegboards. If you have any questions about this product by LocBoard, contact us by completing and submitting the form below. If you are looking for a specif part number, please include it with your message.